Thanks so much for asking me here today! I’m a big fan of your podcasts so it’s a big honour. Fourteen Days Later was my debut novel – a romantic comedy that hit the Top 100 on Amazon in the US and UK and B&N. Think Bridget Jones meets My Big Fat Greek Wedding. It was shortlisted for the Harry Bowling Prize in 2008. My Amber Fox Series are fun cozy mysteries featuring an accident-prone insurance investigator. 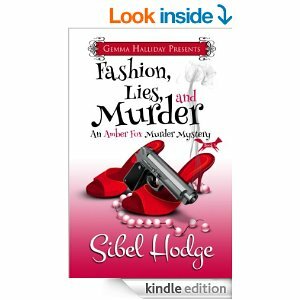 The first two books in the series, Fashion, Lies, and Murder and Money, Lies, and Murder also hit the Top 100 on Amazon US, UK, and B&N. 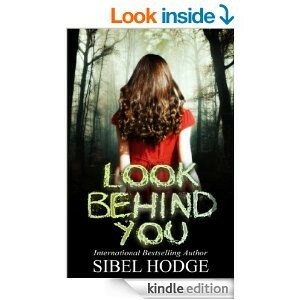 Look Behind You is a dark, edge-of-your-seat psychological thriller/suspense, which is a new genre for me, but has done amazingly well so far. Within eight weeks of being released it hit the Amazon UK Top 2, Amazon US Top 40 and Amazon Australia Top 4. You’ve had great success with three different genres. Do you prefer writing one type of genre more than the others, or are they all equally fun to write? I love reading a mix of genres – chick lit, romantic comedies, mysteries, thrillers – but it felt natural for my debut novel to be a chick lit romcom. I think my writing journey is a reflection of life’s journey, and I’m always trying to grow and learn. As things have progressed, so has my need to tell the story that is most important to me or itching to get out at that time. I love writing the fun stuff, but I also love the darker stuff, like Butterfly, The See-Through Leopard, and Trafficked, which hopefully raise awareness to serious issues going on all over the world right now. I’m lucky as an Indie Author to have a voice I can use for subjects that are important to me. What has been the most effective promotional tactic/strategy for your book sales? I wish I had the magic answer, but I don’t think there is just one. What works for one book or author might not work for another. For me, it’s a matter of trying different things and seeing what works. It’s trial and error a lot of the time, and most advertising methods, like Bookbub (which gives amazing results) will only give you a short-term boost in sales. One thing that’s important is to have a backlist. Having more books on your virtual shelf means the readers who enjoy your work will hit that “One Click Buy” button if they see you’ve got other work out there. Having the first book in a series priced really cheap has always been a great sales tactic for me, too. What has been the least effective promotional tactic for your sales? Permafree. Although it probably did increase sales of other books in the series, I think some people only download a book simply because it’s free, and not something they’d normally read, which can increase the amount of negative reviews. What advice would you give an author that is having trouble getting reviews for their work? Goodreads has many different reader groups for each genre and a lot of them have a Read 2 Review programme, so that’s always a good option. You could join a Netgalley Co-op with other authors to generate reviews, although my experiences with that weren’t very successful. I think some genres do better than others with Netgalley. You can contact book bloggers who like reading your genre, or also book a review book tour with a blog tour company. I’m a huge proponent of mailing lists for authors. Do you have any tips on how to grow your mailing list and to use it to maximize book sales? I would add your mailing list details to the end of your books so readers know where to go to sign up. Also add it to your bio page on Amazon, B&N, etc. You can offer monthly competitions/freebies for people who are signed up to the list as an incentive. I’ve tried different things with different books. I usually always do a giveaway, and I think it’s great if you can get other authors involved to donate their books, too. It’s win-win for both of you as it exposes you all to each other’s reader base. I’ve done one review book tour, which was great fun but didn’t yield many sales. I also email bloggers/reviewers who like my books or genre in advance so I can hopefully get some reviews generated straight off the bat. If you have a street team, they will be really important at the book launching stage. What is one thing you know now about publishing that you wish you knew when you first started out? This applies to life, not just publishing, but there’s always a Plan B! Even if things aren’t going according to the plan you have right now, if you believe in yourself and your dreams, a Plan B will always find you when the time is right. If you can dream it, you can do it, so have faith that everything will work out and ignore any negative thoughts. Everything is a journey, but it’s important to enjoy the whole ride, not become frustrated if you’re not going where you think you should be. What advice to you have for an author that is just starting out and is troubling getting initial sales? Be patient. It’s a steady plod not a race. There are things you can do to try and raise awareness of your books, such as pricing, contacting reviewers, bloggers, doing giveaways on Goodreads, etc. But sometimes it takes a while for your book to gain traction. And while your waiting, write another one! Some have worked out great, others not so. I think it’s very important to have a team of authors who are equally as energetic about marketing and promoting it to make it successful. To have a chance of hitting a Bestseller list with a boxed set, the pricing needs to be right, probably $0.99. Publicizing should include a mixture of the right paid ads, taking advantage of any author’s social media and mailing lists, blog posts, books reviewers, etc. You’ve written both romantic comedy, cozy mystery, and psychological thrillers, among others. Do you find that most of your fans crossover to all three genres, or do you have three distinctly different fanbases? I don’t think a lot of my readers do cross over so writing in a different genre is kind of like starting out all over again. But I like a challenge! Do you have any advice for finding success on other platforms such as Barnes & Noble, Apple, and Kobo? I wish I did as my sales on those channels probably account for around 20%. After an unveiling of the new Apple iOS 8 operating system on June 3, Mark Coker reported that iBooks will come pre-installed on iOS 8, which will hopefully give everyone’s iStore sales a massive boost. Congratulations on signing with Thomas & Mercer. What made you sign with them, and what was the process like? For example, did they come to you? Were you approached by any other publishers? Thanks so much, it’s very exciting. I have to say the whole experience has been smooth and very enjoyable so far. Another author friend of mine, Mark Edwards, who is also signed with Thomas & Mercer, let his editor know how well Look Behind You was doing on the Amazon charts and so she started reading it on the tube on the way home on a Friday night. (Thanks so much, Mark!) A few hours later I had an email from her telling me she was really interested in it for T&M and what did I think? I know that Amazon Publishing Imprints have a reputation for being author-friendly, along with their editors, and they have amazing marketing potential, so I’m very happy to be part of the Thomas & Mercer team. I’m working on a fun cozy mystery which will be part of a multi-author series. Then I’ll be working on my next psychological thriller, and after that my 5th Amber Fox Mystery. Oooh, and a film deal would be nice (I can dream)!